Here are a few of my favorites from this week. I absolutely love decorating children's rooms. And I adore a good theme room...they can be so hard to pull off. I am Momma Hear Me Roar shared one of the cutest cowboy rooms I've ever seen! Check out the bed...made from MDF and painted....oh. my. goodness. I'm always on the lookout for a great message board. I just love this one by Nice & Easy Antiques. Burlap and chicken wire! Be still my heart! 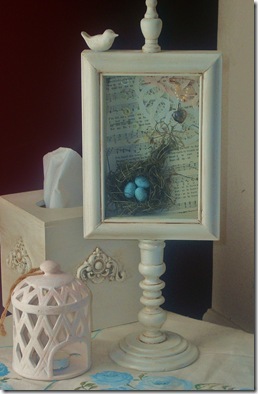 All Thingz Related shared how she made this lovely spring bird's nest shadowbox. So pretty!! Spring is a perfect time to lighten up your decor. 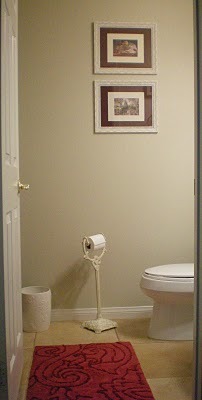 Holly's Haven shared her restful powder room redo. I especially love the textured wall treatment...wait til you see it! 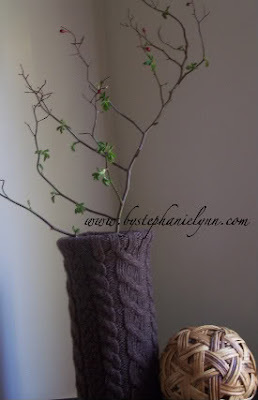 And last but not least...Stephanie Lynn shared a very clever vase made from a recycled sweater. This is definitely one for my files!! Thank you to all who participated in last week's Frugal Friday! Can't wait to see what you all come up with next time! I have a few spots coming available for April sponsorships. If you are interested in advertising on the Shabby Nest, you can find information here. aww. that teeny chair is adorable. cute finds. Ahhh, I feel so special. :) Thanks for boostin my ego! ;) I am in love with all of these ideas. They really get your head spinning,...right??!! That little kiddie chair though,...oh my,...that ones makes my mouth water! Thank you for hosting Frugal Friday for us every week. WOW love the chair and the message board. Such talented bloggers our there. Aw, thanks for featuring my chair! I'm in such great company - I love all the projects you featured! Awww! Thanks for linking my cowboy room. There were some great things this week! How fun! I love that kids chair. THANKS for you sweet sweet comment yesterday!! I think Christy and Beach Brights Blog has the same story you do ( fashion background, etc) :) So funny that I inspire anyone. But it feels great to help moms get their fashion groove back! It is a wonderful rewarding job I have! Wow - Thank you so much for adding the vase to your linky love ~ I'm so honored to say the least. I am amazed at all the creativity - these projects are simply fabulous. Thanks again for hosting! We greatly appreciate it! As a designer myself this is the way to do it. Instead of buying something from a box store, it is way more rewarding to craft it yourself and what you have displayed shows the beauty of that. Thank you! Oh i would love to get my hands on that message board! another great week of great ideas! !